Because Los Angeles is sorely lacking in a weekly restaurant review, I’ve begun writing one. To learn more about my process, click here. Please subscribe to this blog to receive the reviews in your inbox. A Monty’s Good Burger double cheeseburger with a side of fries. It’s a sign of my moral strength that I was a vegetarian for 16 years. It’s a sign of my moral weakness that I need to keep telling everyone that. I was on the bandwagon early, in 1983, and even though by then I had read all the solid environmental arguments for avoiding meat, my reason for becoming a vegetarian was very simple: I decided I liked animals too much to want to kill them. For 16 years I avoided fish and seafood, and all meat and poultry. My devolution back to meat-eating, which began in 1990, has come with a constant, nagging sense of guilt. When it comes to eating meat, my love for the tastes and pleasures of food is always circumscribed by what the writer Adam Gopnik calls “the moral taste” of what I’m eating. I’m far from Orthodox, but my feeling that meat is inherently mean still nags. The best cut of meat can taste wonderful to me, and, at the same moment, slightly off. I wish that would change, and I can just enjoy meat, or do without it. But this is me. One way around this dilemma is to find vegetarian foods which satisfy meat cravings. If the middle way is to eat more plants and less meat, the solution is to find really yummy plants. That’s where Monty’s Good Burger comes in. It’s in a narrow slot on Western Ave. just north of Sixth street in Koreatown. A dude stands in front of the flat top pressing fists of what looks like freshly-ground beef onto the grill. He lets them sizzle, then tops each patty with a slice of yellow cheese. Meanwhile, the place fills up with hipsters, talking over the loud music, leaving vapor trails of pot as they crowd toward the few tables in the back or line up at the counter. The menu, posted overhead, is brief as can be: a single or double cheeseburger with lettuce, tomato and grilled onions. Fries or tots. Shakes and… a kale Caesar. That last entry is your only clue, I mean the only clue, that everything in this burger joint is vegan. The burger. The cheese. Those shakes. The guy behind the counter explains to several new customers that the burgers are veggie and the shakes are made from soy. My order was a double cheeseburger, a kale Caesar, fries with Siracha aioli, and a chocolate shake. In other words, pretty much the whole menu. I sit. It’s past 10 pm, and the place keeps filling up. Tattoos. Rocker shirts. Baseball caps. The vibe is far from vegan. One after another the fry baskets lower and sizzle in the hot oil. The grill guy keeps pressing burger balls flat. The shake machine whines over the music. ed onion hanging from his chin, looks particularly glowy or lithe. They just look…happy. I bit into my burger– and I was happy too. 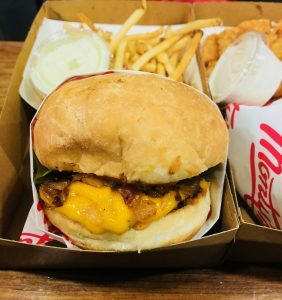 The bun is warm and soft, the generous grilled onions carry most of the flavor, a special Thousand Island-like sauce keeps things drippy, the tomato and lettuce are cold and crisp, and the burger, it’s close enough. It’s made from the much-hyped Impossible patty protein, and it crisps up to a nubby exterior that allows the cheese to meld tightly to the crust. The inside is burger-like. It has none of the flavor, blood or tang of freshly ground chuck. But it has the salt, grease and umami of a fast-food patty. The fries are shoestring, fresh and crisp, splitting the difference between McDonalds and In n’ Out. The shake was easier to spoon than to sip, with a Fosters Freeze consistency and extra drips of dark chocolate syrup. 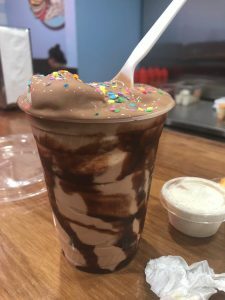 I’d like to believe I could tell the difference between it and a real ice cream shake. I’d be lying. 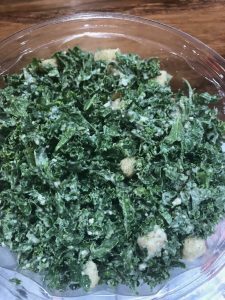 It took many many bites to chew the kale salad, whose jigsaw pieces were tossed with tiny croutons and dressed in a lemony Caesar. To actually finish it would have taken me an hour of raw kale chewing. I may not comfortable eating cows, but I’m not eager to eat like one either. The counter at Monty’s Good Burger. I put the salad aside and returned to my double cheese. And fries. And shake. 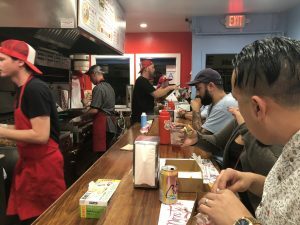 The burgers were still hot, and by then they reached pure burger Synchronicity, when everything is squished together, when the crisp and hot and salty and fresh and greasy all merge into a juice and flavor- giving whole. It’s at that point the option of saying, “I’ll have another,” seems perfectly reasonable. Monty’s may be the first vegan restaurant to have not just a moral taste, but a fun one as well. Monty’s Good Burger. 516 S Western Ave Los Angeles, CA 90020 (909) 259-0652. I ate at Monty’s Good Burger once, and ate all the main things on the menu. I missed the Tater Tots. Next time.